Since we heard the first Tellurium Q cable back in 2009, the company has consistently built on its early achievements, and now sits as one of the most respected cable companies with a range that covers virtually every audiophile's needs. A seemingly endless stream of press awards and feedback from satisfied users confirms our belief in them is justified. Tellurium Q have also just received the Queens Award for Enterprise 2018. Tellurium Q is the first range of cables specifically engineered to avoid phase-distortion. To achieve this goal, this made-in-England cable has received attention to every parameter, both electrical and mechanical. Conductor material, construction, doping and geometry; dielectric properties and vibrational damping - these along with perfectly balanced inductance, capacitance and resistance result in a cable range with unique virtues. By avoiding the time-smear and colourations that are caused by phase distortion, the nuances, dynamics and rhythmic insight of the performance are preserved. Find out why more and more people are talking about Tellurium Q products. You do not have to believe all the incredible reviews, just test our products for yourself against anything else in the same price range and hear for yourself the tangible difference. 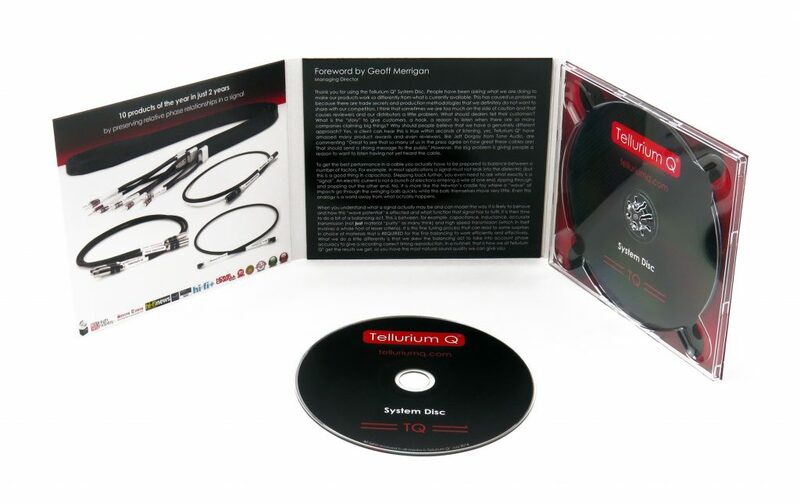 Find out how your music can really sound and talk to your nearest Tellurium Q dealer or contact us directly, now. Tellurium Q cables simply reveal the music. This range is the most affordable entry into Tellurium Q’s world of combating Phase Distortion. It consists of three speaker cables a Power Cable and a range of signal cables. These cables may be very cost worthy but there is no compromise in the approach or the performance at their relevant price points. Their sonic qualities are often described as offering a slightly warmer balance to the presentation, often simply taking the harsh edge or brittle edge from more entry-level products. This often making the perfect foil for the more modest or budget priced electronics & loudspeakers. This is where it all began - the original yardstick that has blazed a trail since 2009. When the Black cables were introduced they cut a new standard in the performance bracket, almost irrespective of the price point. Quickly followed up by the multi award winning Ultra Black speaker cable and interconnects, this product line has cemented itself into the heart of some of the best Audio systems available. The range is very natural/neutral and allows for an incredibly life like presentation. Used in a well balanced, well setup system it can simply open the door to a whole new musical experience for so many listeners. The Black range consists of the fantastic Black II, Ultra Black and Black Diamond speaker cable and includes partnering interconnects and mains cable. The Silver range has all the benefits associated with Silver as a conductive material but without the fatigue & harshness often exhibited with its application. The length and detail taken on the development of this range is quite extraordinary. This product range is open, explicit with an uncanny ability to see into the very heart of the music. If the system is in balance then this will take you closer than you have been before. There are three speaker cables in the range – Silver II, Ultra Silver and Silver Diamond. In conjunction with the matching signal cables, be that analogue or digital/USB, the music lover is enveloped in a new experience. Statement is quite literally Tellurium Q's statement of the best that they can produce. As a cable range - speaker, interconnect and power - it sits above all the other ranges, and possibly all other cables on the market. It is difficult to explain exactly what Statement does - or doesn't do - as results will differ according to system capability, but our ears tell us that this is a remarkable cable range and one that has to be heard if looking for the very best. Statement is only available through a select few dealers - these are indicated on our dealer list. Discs of this nature have been around for a long time BUT like all things from Tellurium Q a totally fresh and honest approach has garnered a critically acclaimed result. There is no need for a lengthy explanation with this excellent but simple product. We urge you to contact a dealer, purchase one and find out for yourself!